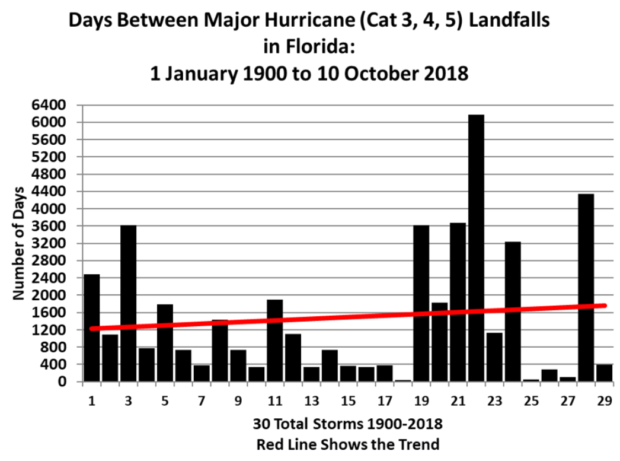 While some scientists warn future warming could put Florida at greater risk of major hurricane strikes, the data does not show an increase in Category 3 or higher storms striking the Sunshine State over the last century. University of Alabama-Huntsville meteorologist Roy Spencer crunched the numbers and found “there is still no trend in either intensity or frequency of strikes over the last 118 years,” according to a recent blog post. Michael made landfall as a near-Category 5 hurricane with maximum sustained winds of 155 mph. The storm brought up to 15 feet of storm surge to parts of the Florida Panhandle, and left 1 million people without power and 11 dead by the time it weakened into a post-tropical cyclone on Friday. Analysts expect the economic damage from Michael to be upwards of $30 billion, with privately insured losses hitting as much as $8 billion. Michael is neither the first nor will it be the last major storm to strike Florida. Nearly half of all U.S. hurricane strikes hit Florida, which experts say is because of the state’s 1,300 miles of coastline in warm, tropical waters. The most recent United Nations climate report projected major hurricanes would become more frequent relative to today because of ocean warming. Places like Florida, scientists say, will be more at risk of a major hurricane strike. Nelson echoed arguments made by some scientists, pundits and activists who want to reclassify hurricanes as “unnatural” disasters, arguing they are being strengthened by man-made warming. However, even as the Atlantic Ocean has warmed, which many scientists attribute to human activities, there’s been no increase in the number of major hurricanes hitting Florida or the continental U.S. as a whole. 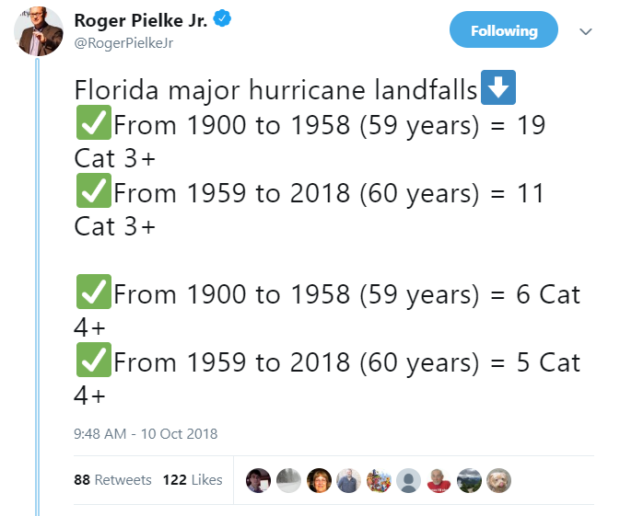 Meteorologist Philip Klotzbach tweeted that “[l]arge decadal differences occur in the frequency of these powerful hurricanes hitting the continental US.” Klotzbach also said there may have been landfalling major hurricanes not tracked prior to the satellite era. “Hurricane strikes in the U.S. are notoriously variable, as evidenced by the recent (and unprecedented) 11+ year ‘drought’ in major hurricane landfalls, which was finally broken in 2017,” Spencer wrote. Spencer also pointed to an older study that reconstructed hurricane landfalls in the Florida panhandle going back thousands of years. What the study found was “the last 1,000 years have been relatively quiet for Category 4 to 5 hurricanes, but the period from 1,000 to 3,400 years ago was a ‘hyperactive’ period for intense landfalls at that location,” according to Spencer.